In a smallish bowl, stir together all of the baking powder, flour, and cocoa powder. Set aside. Using a stand mixer with the paddle attachment or an electric hand mixer, beat the butter on medium-high speed until creamy. Slowly add the sugar and mix until the mixture is completely smooth and soft. Add the eggs, one at a time, mixing well after each addition. Scrape the sides of the bowl as needed. Beat in the salt and the vanilla, add the melted chocolate, and beat on low speed until it's all incorporated. Add the milk and beat again, until combined. 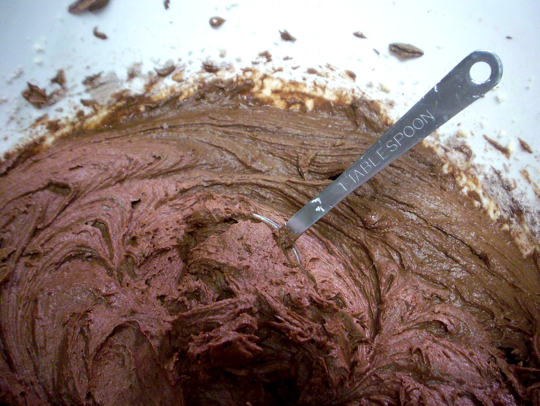 Add the flour mixture and beat again until it comes together in a gooey mass similar to chocolate frosting. Using a rounded tablespoon measure, scoop heaping tablespoons and drop about an inch apart on the prepared baking sheets. (Jamie note: I found a small pointed cheese knife to be very helpful in getting the batter out of the spoon). Bake the cookies until they are just barely firm on top and very soft on the bottom, about 7-8 minutes (they will get firmer as they cool). Transfer to a wire rack and cool completely (sneak a couple while they're still warm). They will keep for several days in an airtight container.